A little north of the main 14th Street corridor, new kid on the block Rooster & Owl is a pleasant contrast to the chaotic 14th Street I tend to find myself in the middle of. We went to check it out early on a Tuesday evening, when kids were still getting dropped off from school and dogs were pulling their owners along sunny sidewalks. This sense of contentment prevailed from when I walked in the door, until I left the restaurant and found myself back on a street bustling with evening activity. Rooster & Owl was opened early this month by local husband-wife team Carey and Yuan Tang (the early riser and night owl, respectively), who speak my love language of sharing food. 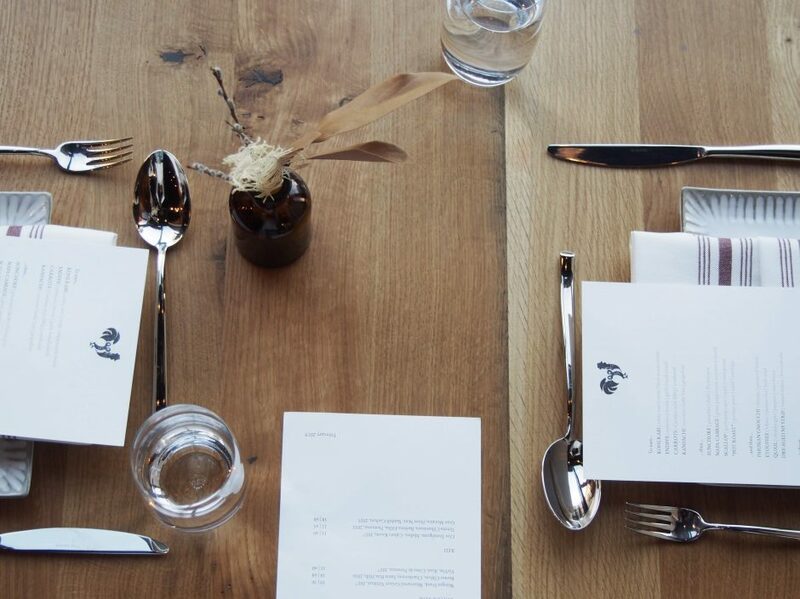 Their market-driven tasting menu is served to share, affirming my closest friends’ modus operandi of eating off each others’ plates whenever we dine out. Each plate is portioned perfectly for two (maybe even three) people to try all four courses that you each select, and not leave hungry. At $65 a head, the portions are quite reasonable! From our window seats in the homey dining area, I just barely had a view of the kitchen activity through open shelving. With a sharp eye, you can spot various rooster and owl memorabilia interspersed among a satisfying arrangement of dry goods presumably brought to life in the kitchen. 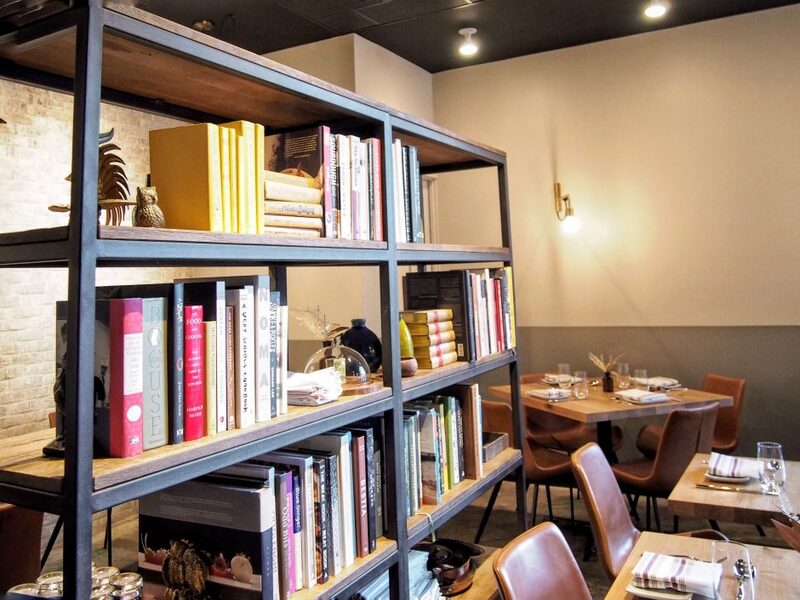 On the other side of the dining room, cookbooks from the Tangs’ personal collection line the shelves, and not just for display. Carey went to show us a cookbook by New York Chef Sohui Kim (under whom Yuan trained in lieu of culinary school), to find it being in active use. The space is somewhere a crackling fireplace would fit right in, like a living room to gather family and friends. In addition to the tasting menu, you can do a $35 drink pairing. We opted for a la carte cocktails, concocted by cocktail program manager Jason Swaringen (formerly of the Green Zone). 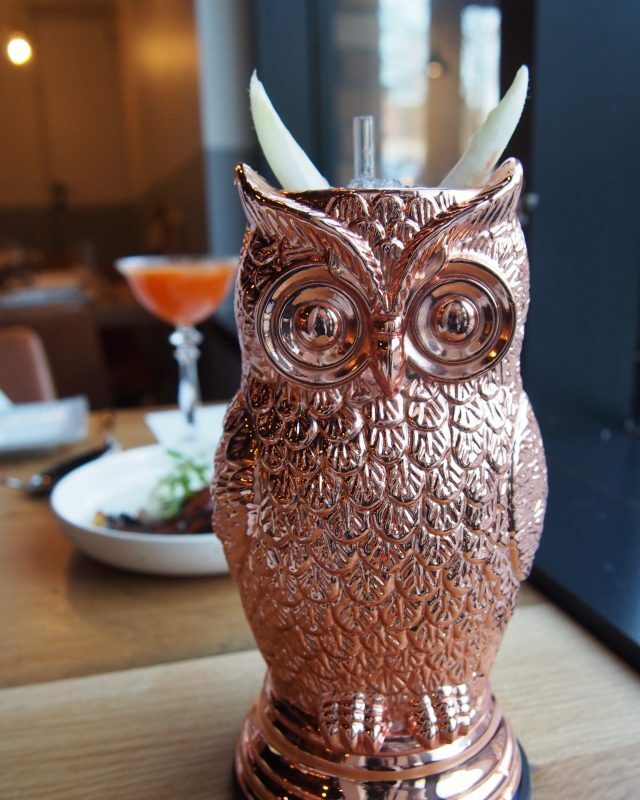 “Endi-ee-ieve Will Always Love You” is served in a surprisingly hefty copper owl with cute little ear tufts made of endives. Bonus points for the reusable straw! Service Bar is the only other bar in DC that can serve drinks in these exclusive mugs, thanks to a relationship with the Absolut Elyx reps. The cocktail itself is everything I look for – not too sweet, refreshing, with a bit of zing. The kind of cocktail I could drink all night and not feel gross. I could eat this bread every day and not get sick of it. My eyes widened when a plate of steaming pineapple buns were brought over to start. It was love at first bite of the sweet crunchy top (scored to resemble the outside of a pineapple) and soft, milky inside with a smear of whipped butter. They remind me of the Chinese bakery must-have of my childhood. 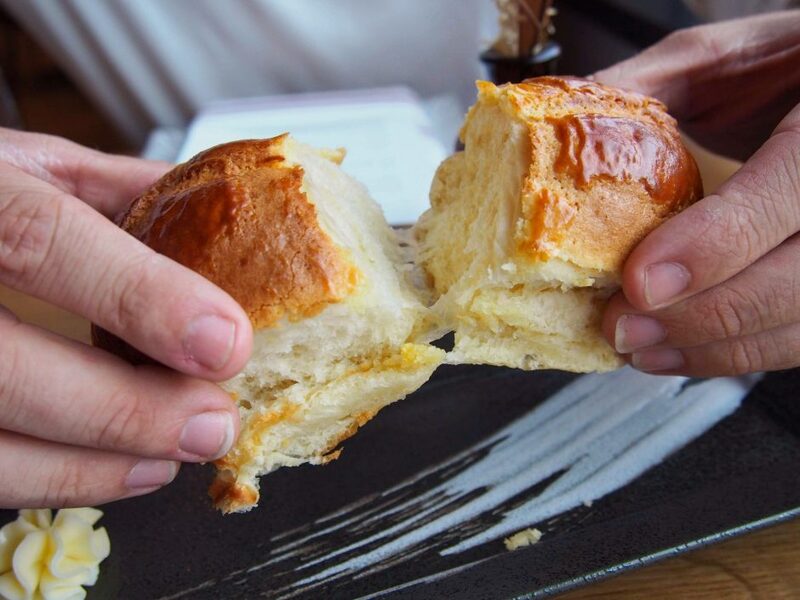 Yuan, whose parents own a Chinese takeout restaurant in Fairfax, spent part of his childhood in Hong Kong, where these buns are a dimsum staple. I hope this complimentary bread offering never changes! In true tasting menu fashion, Daniel and I each selected different items for each of four courses. 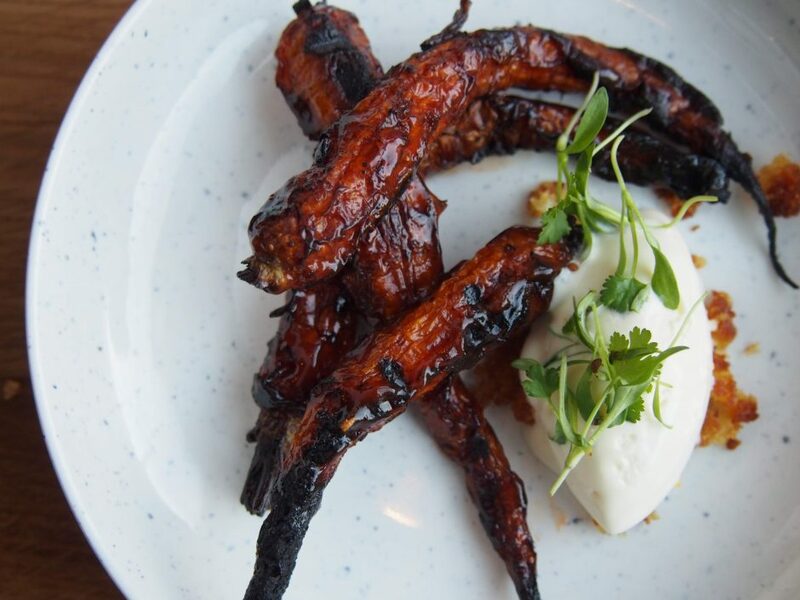 Carrots are sweeter in the winter, lending them to the Carolina-style barbecue rub paired with cornbread ice cream. I learned from our server that carrots aren’t actually good for your eyes – it was a myth propagated by a World War II campaign to make people eat more carrots when food was rationed. Who knew?! 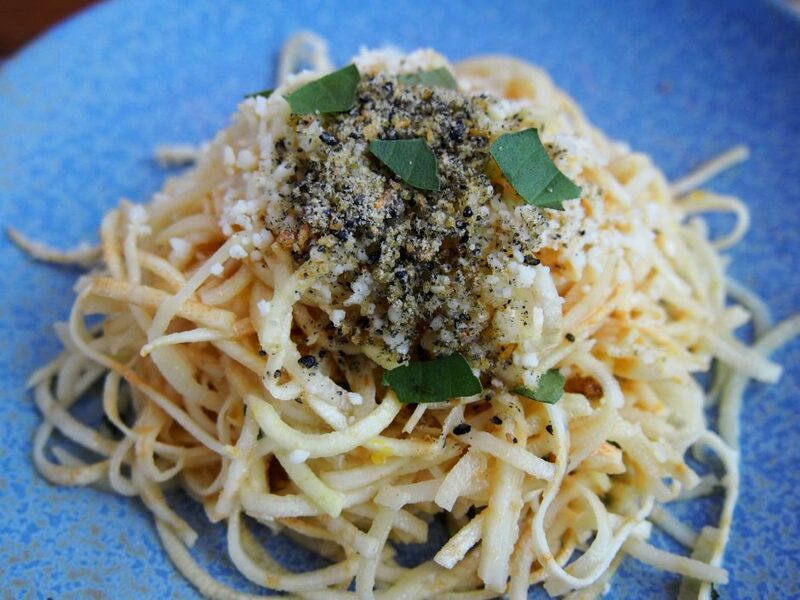 Spiralized kohlrabi (the German relative of wild cabbage) with celery root, cotija, and black sesame brittle resembles cacio e pepe, but it’s served cold and has a slightly crunchier texture than zucchini noodles. Rooster & Owl’s vegetable-forward menu is great for walking that fine line between “treat yourself” and “total caloric blowout” when it comes to multi-course meals. 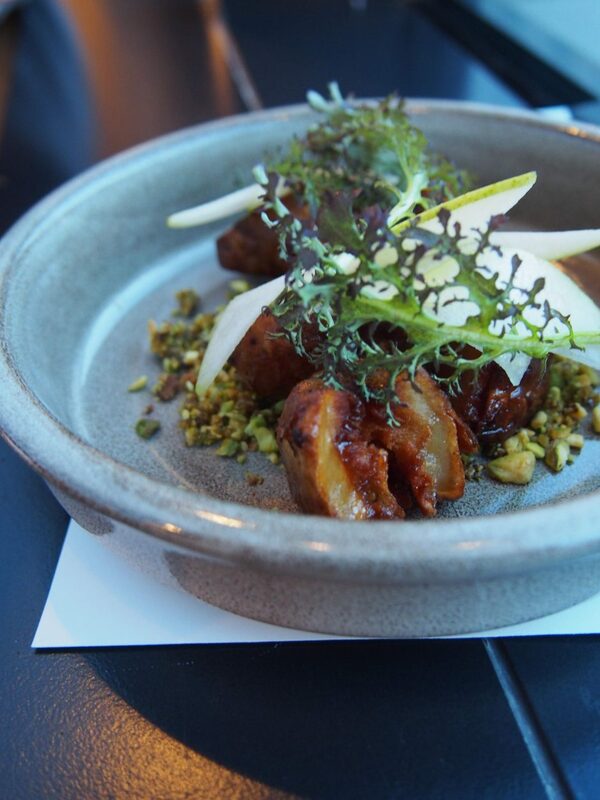 A strong contender for my favorite dish of the night was the perfectly crispy (potato-esque) sunchoke on a bed of pistachio “dirt” scattered around the bottom, topped with dashi (seafood broth) and thinly sliced anjou pears. The pear provides a fresh crunch with delicate flavor, a very subtle sweet-and-salty balance. Sometimes the tastiest dishes are the least photogenic – at this point we were racing against the setting sun, even seated by the big window. I never thought I would ever put scallops and gojuchang (Korean chili paste) in the same sentence, much less in a dish – but that’s the genius of a chef inspired by flavors from all over the world and not boxed into any single cuisine. It worked, but wasn’t my favorite. 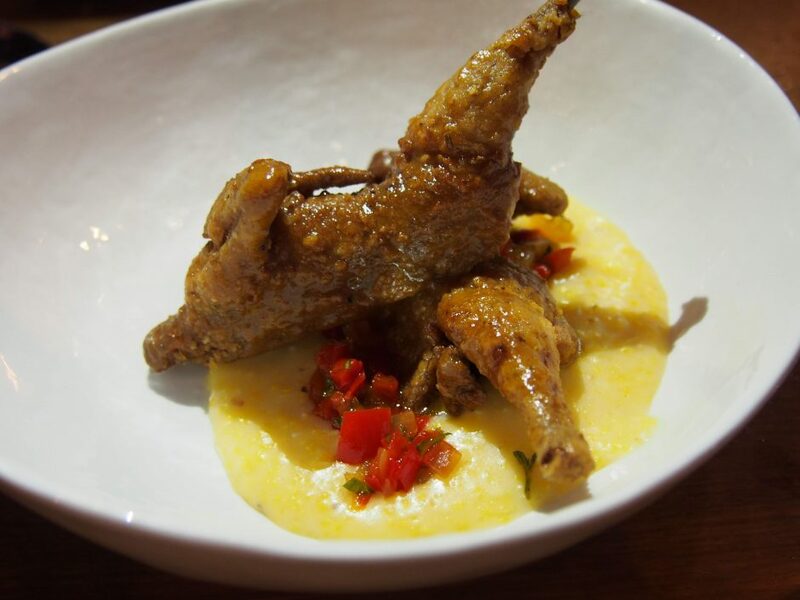 The quail with cheddar grits is reminiscent of chicken and waffles, but with a touch of sweet (as in many Asian dishes) from the honey miso. I asked how long recipe development typically takes, and this one was tested and approved in a single day! 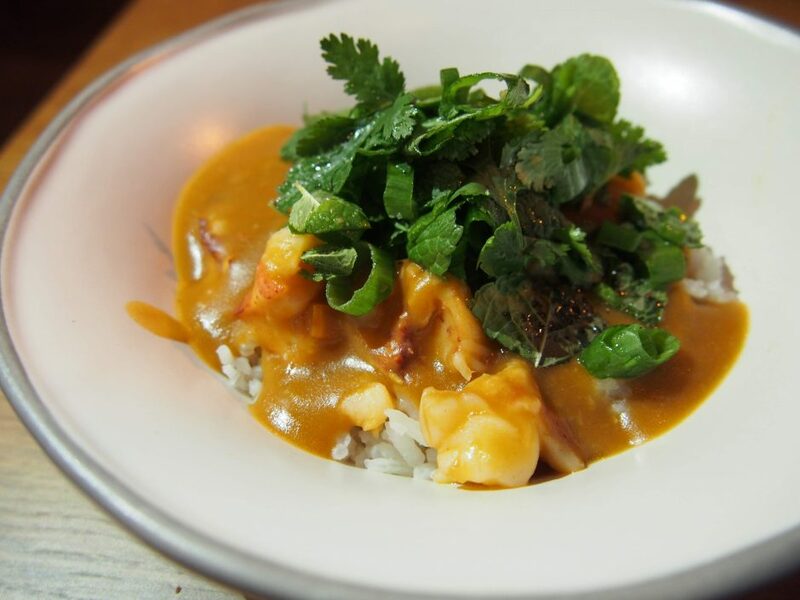 On the other hand, this lobster etouffee took five weeks of evaluating ingredients from local purveyors (fresh lobster and lemongrass from a Virginia farm) to land on this Cajun-Vietnamese twist. Having just returned from New Orleans myself, this dish was also in the running for my favorite of the evening. I usually look forward to dessert the most at any new restaurant. I rarely meet a dessert menu I don’t like! 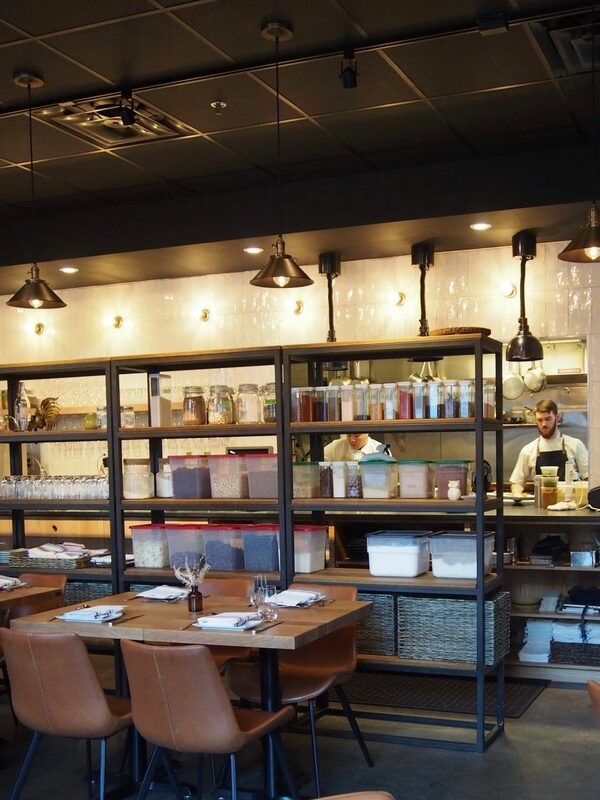 Having followed Rooster & Owl on social media since their opening, I had seen glimpses of what to expect – and pastry chef Olivia Green (formerly of Kinship) did those previews justice. The hazelnut eclairs are filled with light, nutty mousse rather than pastry cream. 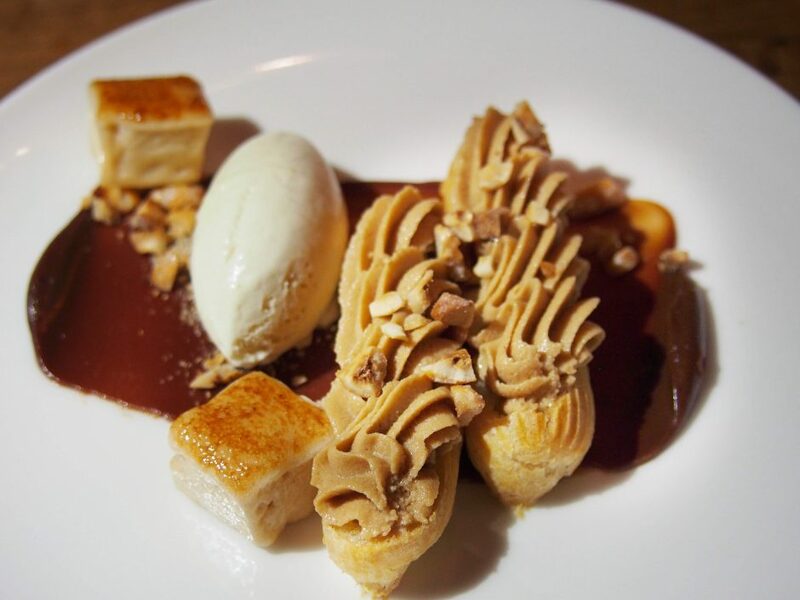 The petite hazelnut marshmallows though, are the stars of the dessert. They melt into your mouth with every bite of brown butter ice cream and dark chocolate ganache. For those seeking to end the meal with something a little lighter: go for the lemon posset (British cream, kind of a cross between custard and lemon curd). 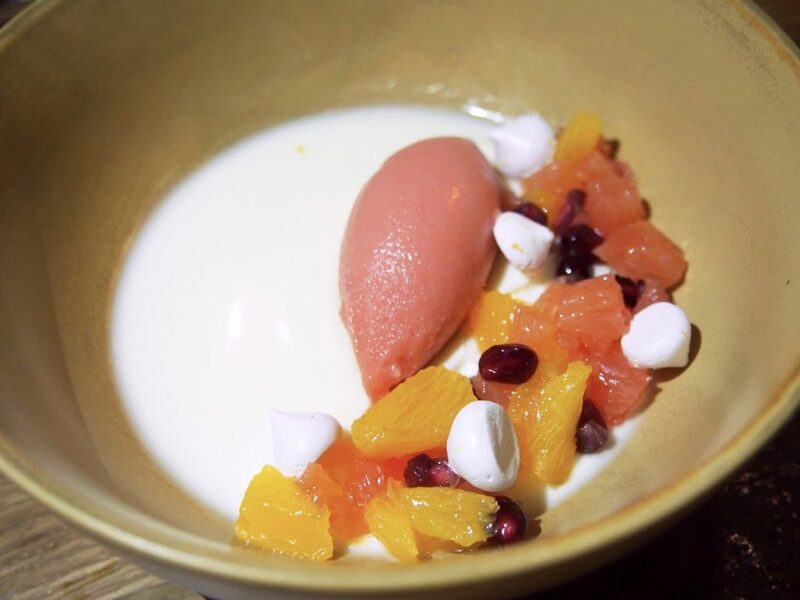 Refreshing blood orange sorbet and the bright pop of pomegranate seeds bursting in your mouth cut into the cream and pair well with the mini meringues. When we asked what Carey’s favorites were, she called out the winter citrus dessert and the endive starter, which we didn’t try as part of the tasting menu. This was at the end of our meal when I was already comfortably full, but Daniel hemmed and hawed, then finally caved to try it as an a la carte option… never underestimate the male appetite. I likened their take on “chips and dip” to dipping veggies into chip-flavored (ricotta, and garlic bread crumbs) dip. I always prefer to end meals with something sweet though, and right after I mentioned this, two little chocolate robots were brought out as the cutest finishing touch! I can’t wait to see how the spring and summer veggie bounty will come together on future menus (and hopefully brunch service, down the line?). 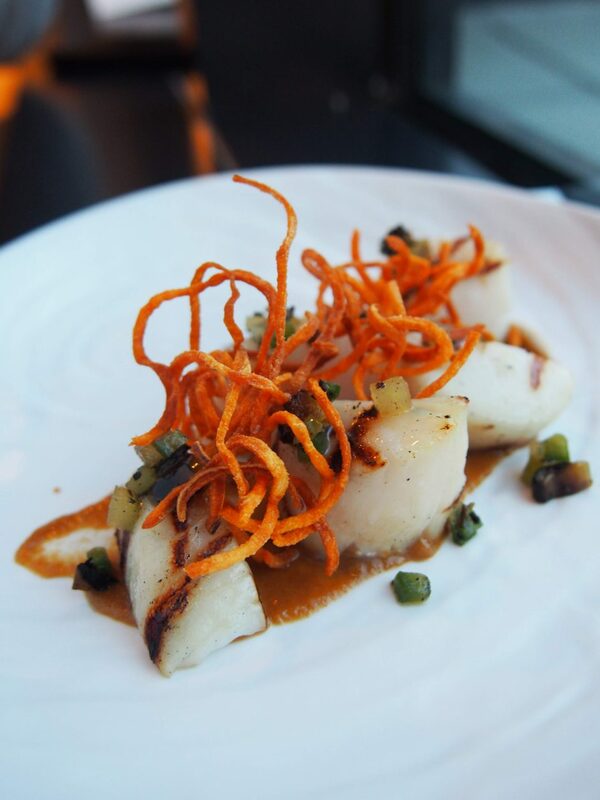 For now, you won’t regret making time in your evening to enjoy a well-paced, artfully crafted meal with a homey ambiance. 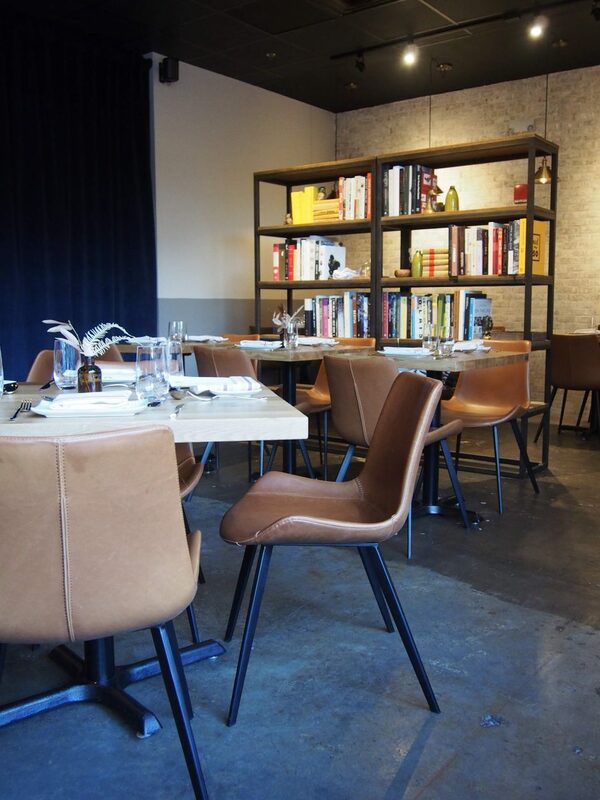 Rooster & Owl is open for dinner 5-11pm Monday – Saturday. For the month of March, Rooster & Owl will donate $10 from the sale of each “Mother Hen” cocktail to Children’s National Medical Center as part of the Make March Matter campaign. Carey and I graduated from the same high school in Northern Virginia, and she returned to DC to lead the donor relations team at Children’s (where she was once a patient herself). I am not sure how she does it all (with the cutest little munchkin at home), but she is an absolute delight – tell her I sent you!